Lake Honrich is a lake in the eastern Rift. 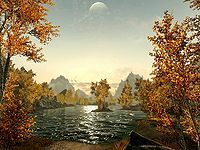 Riften is located on the shores of Lake Honrich, and a set of islands called the Isle of Gold can be found at its center. The lake is drained by the Treva River. In the early First Era, the lake, then called Lake Honnith, was sparsely populated by Snow Elves compared to neighboring regions, and were subject to battles with Harald's forces circa 1E 139. Later that same year, it was discovered that the nearby Forelhost was possibly the last hold out of the Dragon Cult before it was exterminated. 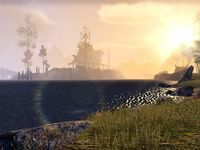 During the Interregnum, the estate of Skald's Retreat served as the home for the most renowned bards in the Old Holds, and was later subject to being merged with the Quagmire in 2E 582. The honey farm of Goldenglow Estate was later located on the Isle of Gold in 4E 201.